With half term looming and a holiday addiction to satisfy my husband and I got thinking about where we could spend a few days. Various other family commitments (parties and weekend visits!) meant that we only really had 3 nights to play with. To complicate matters, my husband set me the challenge of planning a holiday for less than £500. This was going to be a challenge! A quick browse of sky scanner showed that flights were not going to be an option (at least not with the budget!). I’ve since discovered a fab new website that allows you to search for cheap flights – I’ll definitely check this out in the future. I love a challenge! So back to this holiday. With flights not an option we were restricted to the UK or crossing the channel and spending a few days in northern Europe. Once again accommodation in the UK proved to be over priced….at least to get something we would consider suitable was going to cost a ridiculous amount of money in comparison to the same sort of accommodation abroad (the joys of school holidays I guess!). We quickly settled on Bruges….the travel time was easily manageable (at least in theory!) and it offered something for everyone (who doesn’t love chocolate, beer and some beautiful buildings!?!). Perhaps more importantly, I could easily bring it in on budget. 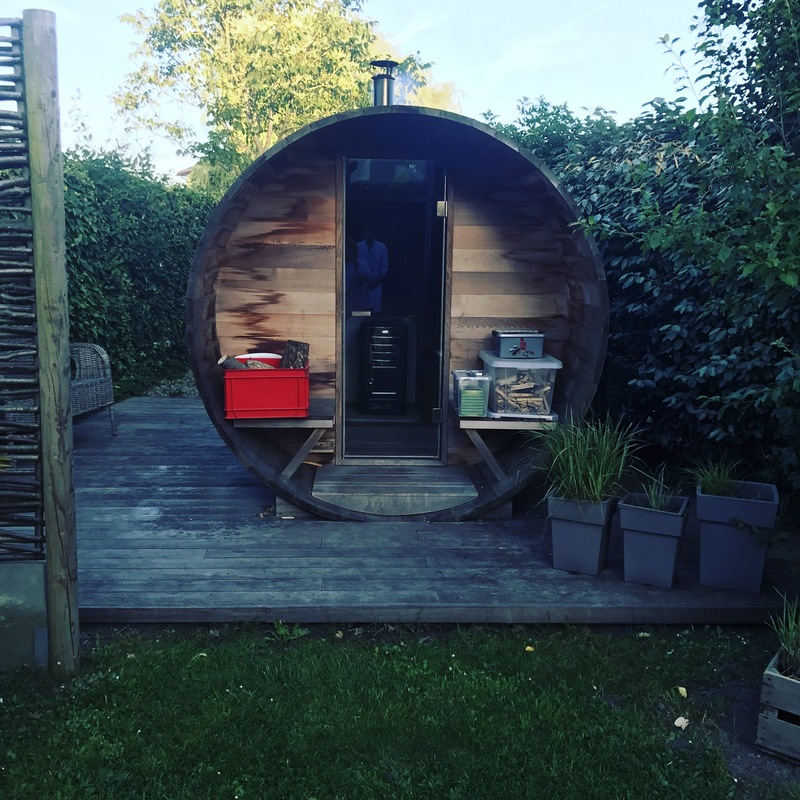 Accommodation (a trusty AirBandB) – £290 for a 2 bedroom apartment with a large spacious garden (not to forget the sauna for mummy and daddy!) for 3 nights. Euro Tunnel – £130 for a car with a roof box (I am incapable of packing light!). As usual we settled on an AirBandB. In my view, they offer so much more for your money, provide a home from home feel and perhaps crucially mean that everyone has somewhere to sleep whilst mummy and daddy also have a space to relax once the little people are tucked up for the night. 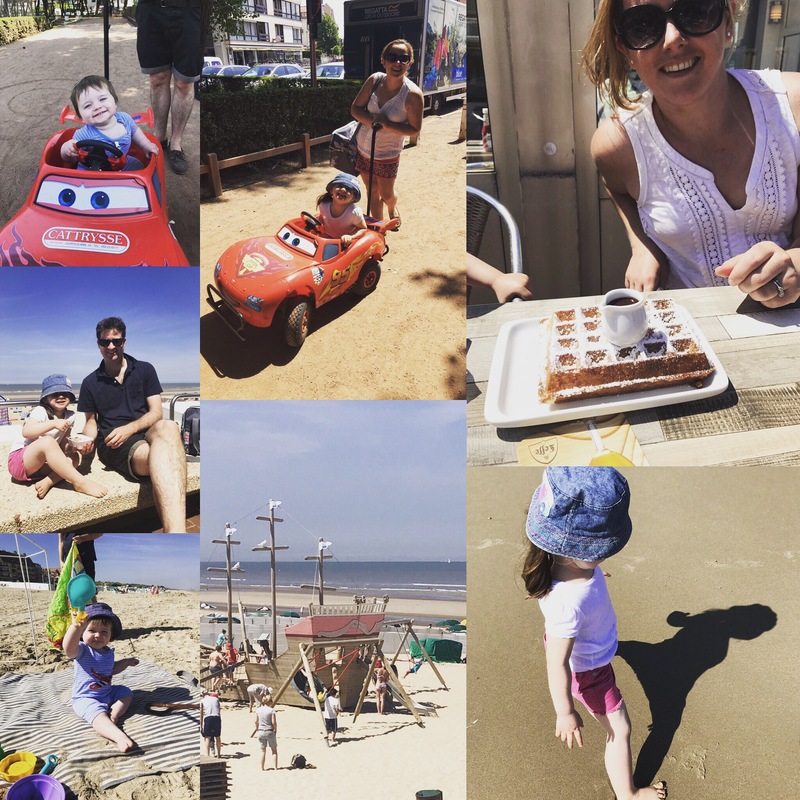 Having been to Bruges before having children we settled on staying up on the coast in De Haan (its an easy 20 minute drive from the city). Not only was De Haan better value than Bruges (and meant we could bring the holiday in under budget!) it would also mean we could explore a new area and have some beach time (which would please the little ones!). We chose a wonderful two bedroom downstairs apartment, equipped with a garden and a sauna and the all important car parking space! The garden was a real bonus. Quite unexpectedly the weather was glorious. We all appreciated being able to BBQ and get some much needed R and R in the garden. The children definitely appreciated having some space to run (or crawl) around and the deck area was a wonderful spot for a drink once the children were asleep. The accommodation was well equipped for children – it had a travel cot, some toys, netflix on the TV, steps in the bathroom and a bath as well as a shower. For us adults, there was a nespresso coffee machine (a must have gadget when travelling with children who wake at 6am! ), the deck, the sauna and surprisingly good bed linen (regulars to my blog will know I’m partial to a feather pillow!). 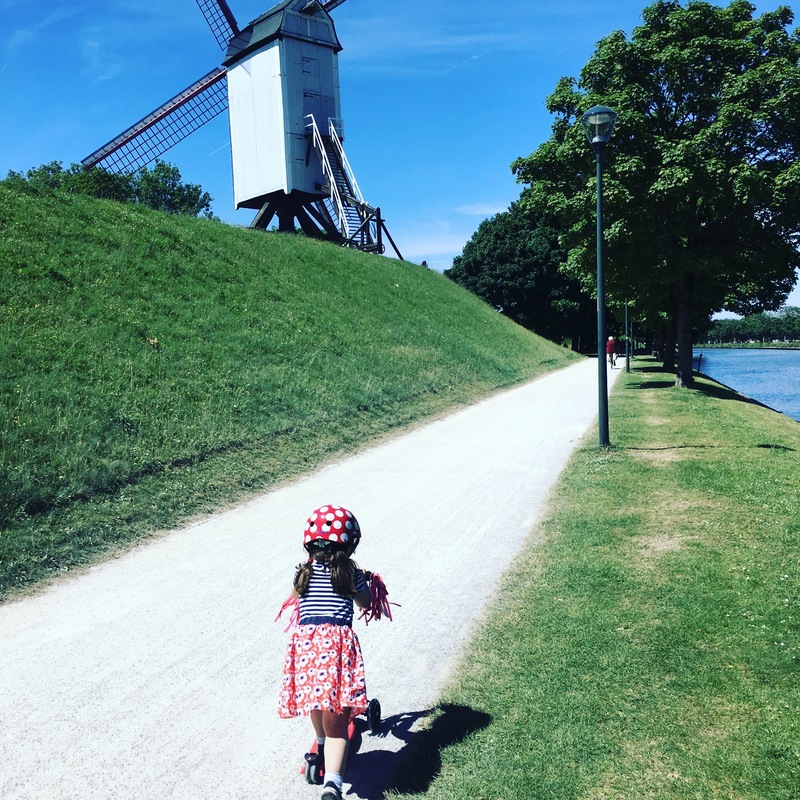 It was located in a quiet suburb of De Haan – an easy 20 minute bike ride from the beach (and the lady who owns the apartment kindly lent us two bikes!). We took our own bike trailer but there was also a number of bike hire places in the town. De Haan itself has everything you’d need (and more). Away from the main beach area there are 3 good supermarkets, so you can easily pick up supplies. 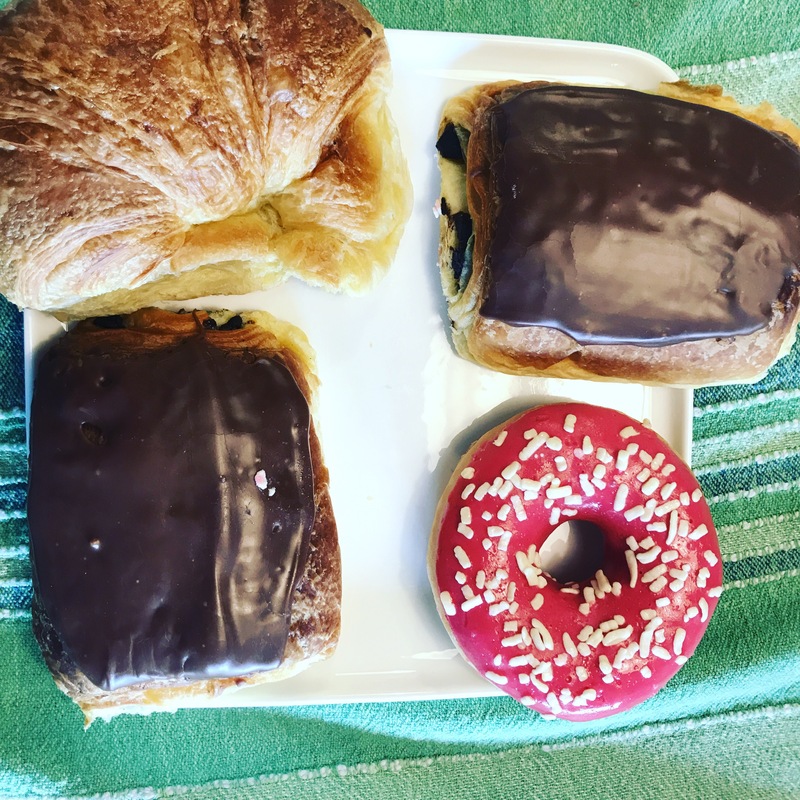 The lady who owned our apartment recommended the Staelens bakery. She warned us it was popular and she wasn’t wrong….we queued out the door most mornings! For ease we opted for the Euro Tunnel. With a crossing of only 35 minutes it has to be the easiest way to travel with little ones (at least in theory!). We booked a fare, taking advantage of the short stay saver deal. We set out at 8am and negotiated rush hour traffic on the M25 to arrive around 11am. I would advise taking a picnic rather than planning to eat in the terminal building. Despite arriving with plenty of time they really do keep you moving and will, without much discussion, put you on an earlier crossing. We had just enough time to pop to the loo before having to drive to the train. It’s also worth noting that depending on how they load you and your car you may not have access to your boot. I only mention it because its worth making sure you have all your must have supplies to hand. The toilets are inconveniently located at either end of the train. Depending on your allocated carriage this could be a fair walk. I checked them out and they were pretty awful…avoid at all costs! I understand from the website that there are children’s play areas in both terminal buildings (in the UK and in France)….but we simply didn’t have the time to check them out despite arriving in plenty of time….we can’t complain though….it has got to be better to be put on an earlier crossing. Our return trip was not quite so smooth. Increased security checks on the French side meant that that we had a long wait at security (approaching 1.5 hours!). We missed our booked train and were allocated to a much later one. When we did board this train there was a technical fault which delayed us further. This delay to our journey also meant that we hit rush hour traffic on the M25 and it took us 3 hours to do 100 miles. My husband helpfully pointed out that the time from leaving De Haan to arriving back in the UK was the same length as a flight to Dubai! Not helpful when you have two over-tired and restless little ones in the back of the car! In all honesty though the children were amazing and with an endless of supply of iPad (and a cheeky trip to Beaconsfield services for a Nando’s!) we arrived home at 8.30pm. A trip to this part of the world would not be complete without a trip to the magical city of Bruges. I’d forgotten how beautiful the city is….you really can just stroll around and every corner promises another stunning vista. We drove to the city and parked in the Biekorf carpark, conveniently locates below the main public library (that also has toilets – handle when travelling with a toddler!). We started our day with a once in a lifetime experience. Whenever we go on a trip I always try and plan something new as I strongly believe that holidays are all about having adventures as a family. Since being a little girl I’ve always dreamt of taking a horse and carriage ride (who doesn’t!) but it was something we never did (and we never had the money as students!). I can’t think of a more magical place to do this as a family. The horses normally congregate in the main market square but on a Wednesday (thanks to the fab market) they move a short stroll away to the Burg square. It was 50 euros for the 30 minute trip (ok so a bit pricey) but honestly worth every penny. Seeing our daughters face was priceless -she was mesmerised. Half way around she whispered that she ‘felt like a princess’, my heart melted. This for me, is what travel is all about. The 30 minute trip takes you around all the main sites of Bruges. As mentioned, we visited Bruges before having children. On that occasion we took a boat trip (a cheaper option at 8€ a head with children under 4 free) but having weighed up the pros and cons I think the horse and carriage was much more worthwhile….you could actually see the buildings and you didn’t run the risk of losing a child over board! Anyway, back to our day. By the time we had finished, been to collect our son’s hat that he had foolishly thrown from the carriage within about 5 minutes of the start, and popped back to the car to collect the pram, it was definitely time for lunch. When in Bruges it has to be chips! We found a chip van (it was actually classier than it sounds!) on the main market square and a bench for our picnic! Chips over looking a main tourist site for the grand total of €8! Not bad! A short stroll after lunch and our youngest was asleep in the pram. Cue a trip to a playpark to tire the other one out! If you’re in need of a park then I highly recommend a trip to Koningin Astrid Plein. Its a little (but beautiful) park a short 5 minute walk from the touristy area. 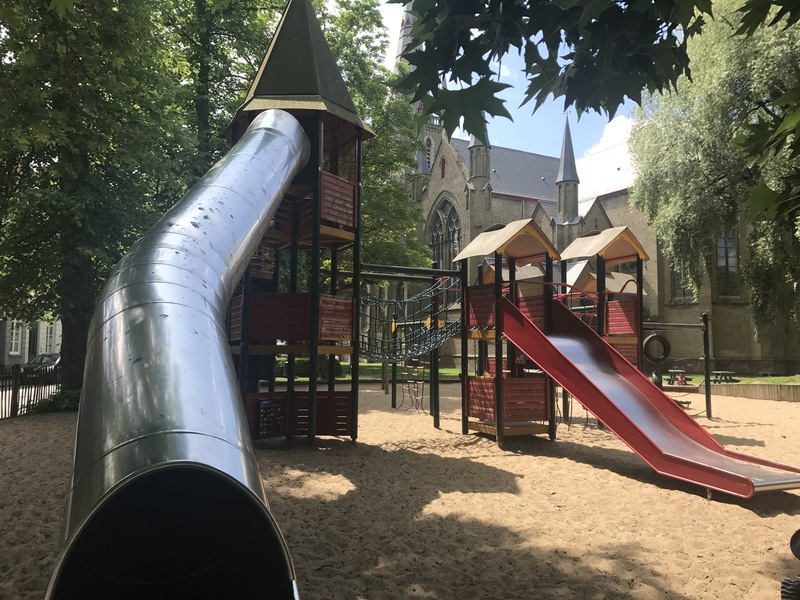 It has a spectacular play park equipped with tunnels, slides, climbing frames (with pirate ship accessories!) and swings for both babies and children. There is a wonderful band stand in the centre and plenty of picnic areas (and picnic tables). So back to the real reason for our trip to Bruges. Our daughter (who like me has a sweet tooth!) nicknamed the holiday the ‘chocolate holiday’ and therefore chocolate was high on our list of must do activities. Dumon chocolate shop comes highly recommended in various blogs. It is reported to be one of only a handful of chocolate shops in the city where the chocolate is actually made onsite. We visited the Eiermarkt shop, a beautifully traditional shop with a family feel. It was conveniently located just over the road from the library (where we’d parked). It is chocolate heaven! Pack a cool bag so you can bring some home for later! Before going I spent time researching where to eat the best Belgian delights (I did warn you I love food!). One of my favourite blogs is the well travelled couple. They travel the world and share their experiences of food amongst other things. They highly recommended Chez Albert for the must have belgian delight of waffles. I urge you to try it. It was hands down the best waffle I’ve eaten. We opted for Belgian chocolate sauce and strawberries! Yummy. Having eaten our body weight in chocolatey goodness we felt a walk was in order. We stopped just outside Bruges to see a series of windmills on a canal (they can be found at Kunstroute Vzw | Korte Vuldersstraat, 30, Bruges 8000, Belgium). There is plenty of metered parking nearby and thankfully the ticket machines can be switched into a number of main European languages (so there’s really no excuse for not getting a ticket!). You can pay by card or cash. Alternatively you can walk from central Bruges. Our daughter loved scooting along the flat and safe paths. We stopped to watch boats passing under bridges and then watched with delight as the waiting bikes rushed to cross back over the bridge (Tour de France eat your heart out!). Does it get much more quintessentially Belgian that walking along canals looking at windmills!?! It was a blissful afternoon. Plenty of picnic potential. If you have a child over 12 they can go inside one of the working windmills. All in all a big hit! So after an action packed day in Bruges we certainly felt we’d earnt our De Halve Maan Brugse Zot beer when we got ourselves back to our sun kissed deck in De Haan. The weather continued to surprise us and our second day was another scorcher. We chose to spend the day closer to home. De Haan is a beach resort on the north coast of Belgium (11km of beach). Its an easy 1.30min drive from the channel tunnel and easily doable with children in tow. It has a wonderfully eclectic selection of buildings – from traditional flemish to modern apartment blocks. It has a vibrancy about the place that appealed. There was plenty of on street parking but I guess in the summer months it could get horrifically busy. It is also served by the coastal tram (at 44 miles long it is the longest continuous tram line in the world – apparently!) 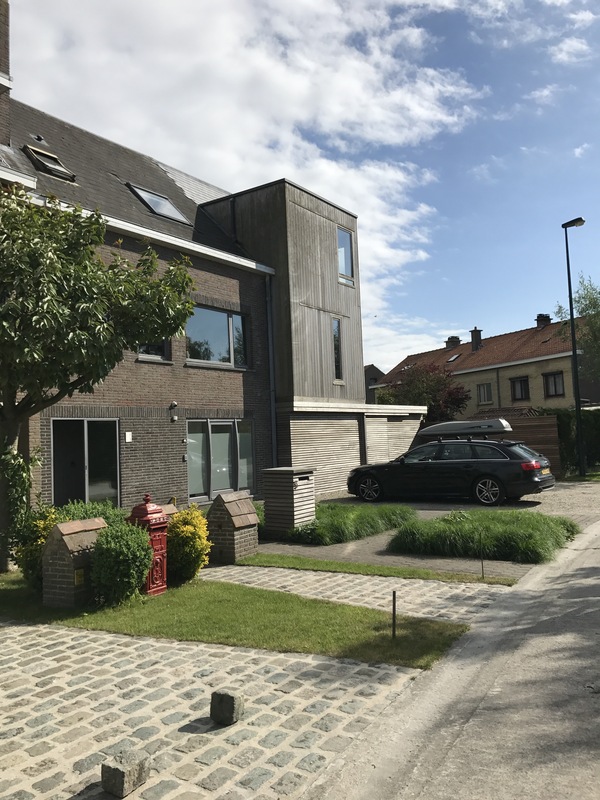 – which links Knokke with De Panne. The beach was spotless. Our daughter appreciated the shells (that reminds me I must dig out the bag of precious shells she insisted on bringing back home!). There’s a wonderful wooden pirate ship on the beach so something for the little ones. You can also hire parasols, wind breaks and sun beds should you need to. If you need a break from the beach then I recommend you head to Mano, a cosy little cafe/restaurant on the beach front. There was plenty of outdoor seating (as well as an indoor area for colder days!). Service was friendly and welcoming and the Belgian waffles (there’s a theme developing here!) were delicious! It’s also handy to know that there are very clean toilets (always useful when travelling with little people!). 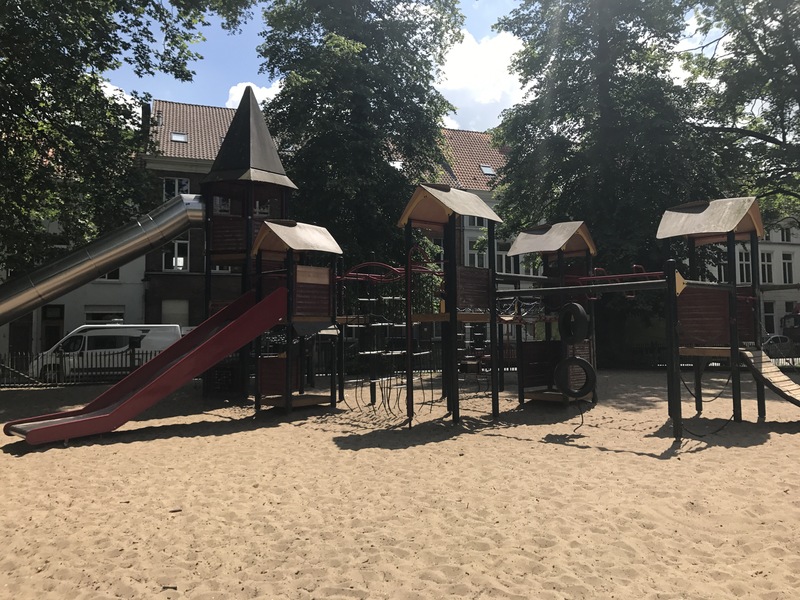 After a fun-filled morning on the beach and a sandy sandwich for lunch we walked the short distance to Park La Potinière (Leopoldlaan, 8420 De Haan). It has two children’s play parks, a mini golf zone, tennis courts, scooter/pram friendly paths and a wonderful cafe in the centre. You could easily spend an afternoon drifting around here. Just over the road from the park is a bike hire place, Cattrysse. 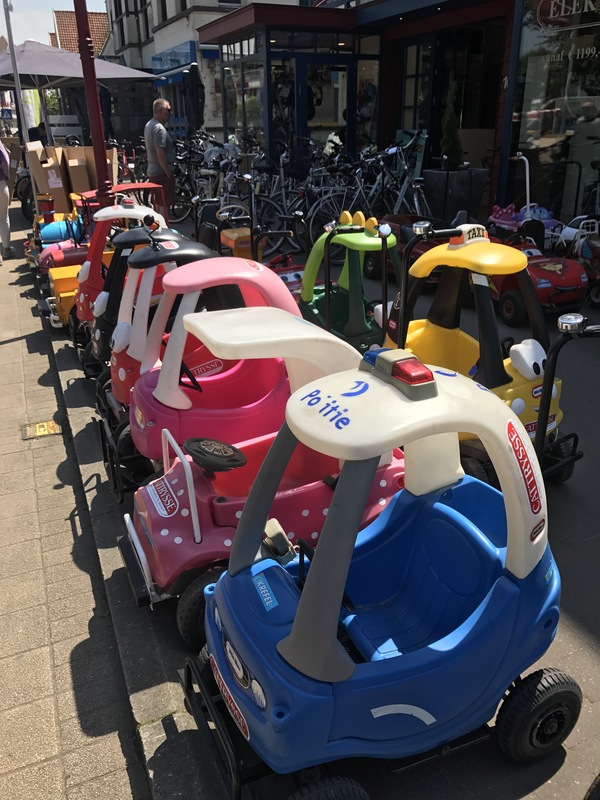 In all honestly it’s far more than a bike hire shop, It also had an enviable selection of children’s cars, bikes, tandems, etc. They issue you with a ticket and you pay on return. It cost us 4 euros for 30 minutes. Both children loved our ‘blaze car’ and we got fit running around the park (win win situation!). A fab day was had by all. Other child friendly activities in De Haan (although as yet untested). Since visiting Center parcs back in January I’ve been on the hunt for a better value alternative. I think I may have found it with De Haan. As you’d expect from Belgium there are cycle paths everywhere so that’s the cycling taken care of. Whilst exploring De Haan I discovered the Sunpark holiday camp. It seems to offer everything that center parcs does but better still you can check in for the day. You can book using the following link. The sunparks brand seems to be part of center parks and has parks across northern Belgium. I’ll definitely add this to travel bucket list. On route back to the tunnel we took a de-tour to De Paane – A slightly tired more shabby relative of De Haan…I’m not sure I’d rush back, if I’m honest. It lacks the charm of De Haan. If you do stop on route to the port/channel tunnel (as we did) then it’s worth knowing that there is a fab looking childrens play area on the beach equipped with bouncy castles etc. You have to pay and I have no idea how much it was but I’m sure little ones would enjoy it. There are some very clean toilets at the far end of the beach (just beyond the play area), past Leopold cafe. They are equipped with a baby changing room if you should need it. We only had an hour in De Paane and chose to picnic on the beach (when was this ever going to be a good idea with two children!). We chose to hire a parasol and two sun beds. Ok so at 9€ it wasn’t a cheap option (we were actually charged the whole morning rate…but hey), but it was too hot for the little ones without it. 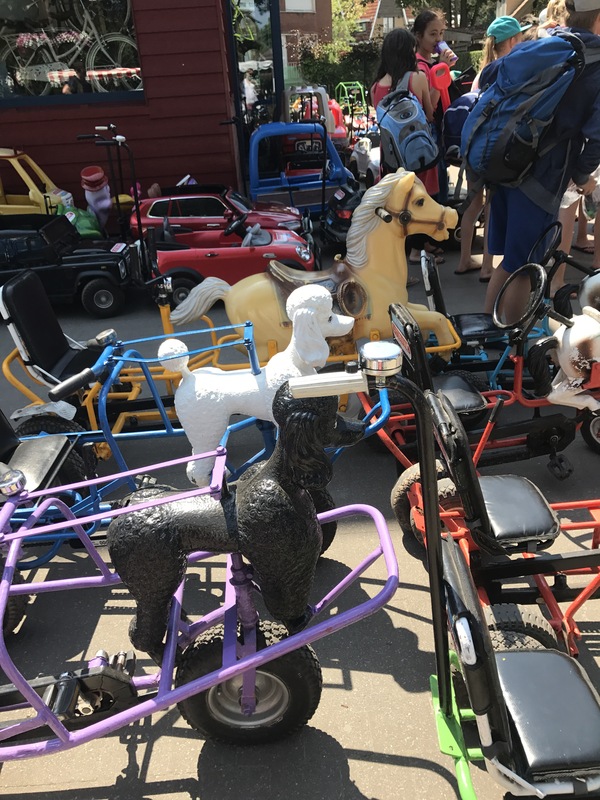 Just outside of De Panne is a theme park – Plopsaland. We didn’t have the time to visit but it comes highly recommended on various travel websites. May be worth checking out. 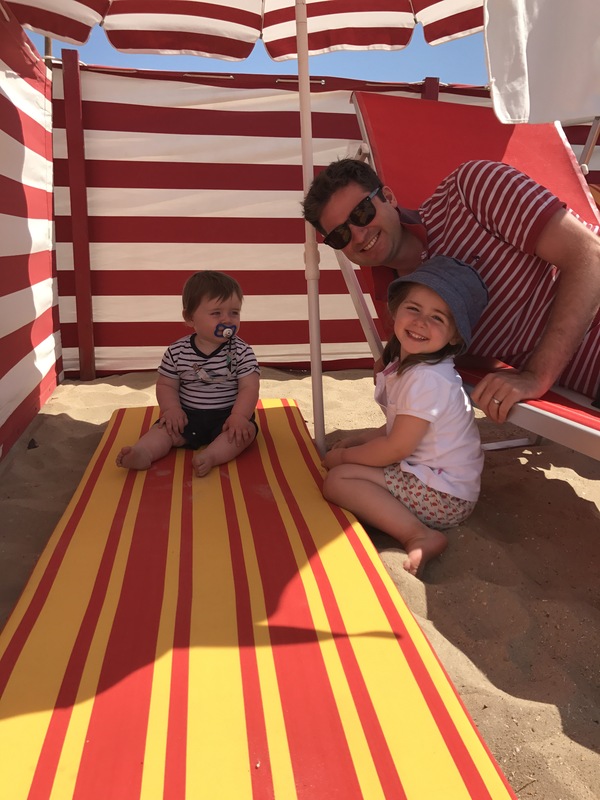 We have just been on holiday with our 14 month old boy to northern France (staying in airbnbs – 4 nights in Lille and 4 nights in the Normandy countryside). Bruges is only an hour’s drive from Lille so we spent a day there – so so lovely! Just wanted to say thank you as your blog was so helpful! We parked in the Biekorf car park following your recommendation (it was perfect and super easy!) and we also went to Chez Albert for Gaufre Liege (our favourite type of Belgian waffle) , again following your recommendation – they were incredible! So a huge thank you to you!